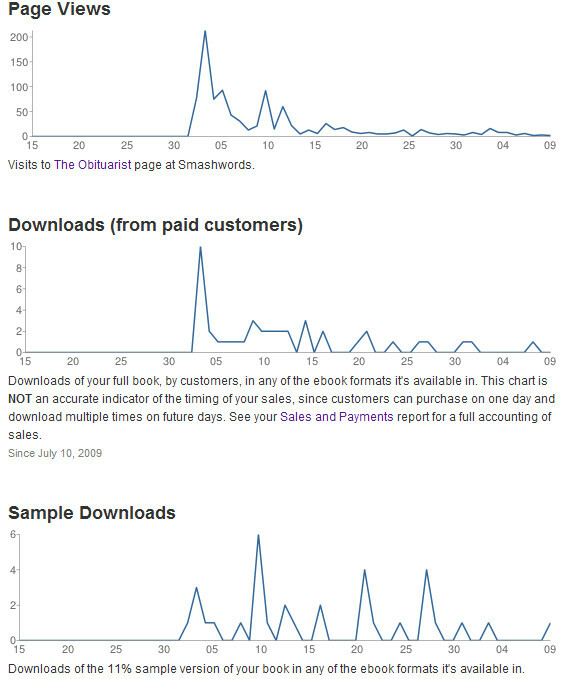 At the risk of sparking off another long post, has there been any sales spikes in your previous ebooks with the release of the Obituarist? ‘Spike’ is an overstatement, but yes, sales of those in May were definitely stronger than they’d been in March and April. But the increase isn’t big enough for me to feel fully comfortable drawing a correlation. Not as far as I’m aware, no – if Amazon or Smashwords have that data they don’t share it with authors. What I could do is see where people click from to get to my site, or at least I could if I any idea what I was doing when playing with Google Analytics. You can see where visits to your site are coming from by using WordPress’ built-in stats – these now live in the Jetpack plugin. I would be surprised if you don’t have it installed, but I know the boffins who look after such things for you can help you out if necessary! I don’t think I have it installed, no – I’ve looked for it before so I can make one of those hilarious Search Term Bingo posts all the cool kids do, but it wasn’t there. Must talk to my boffins about it.